I can do 1 and 3 but I'm stuck at 2. Press ShiftS and select cursor to selected, that will put the cursor at the center of the selected faces. Select Object>Transform>Origin to 3D cursor (or CtrlShiftAltC). All you have to do is SHIFT+S then U. This will work in object mode and edit mode. 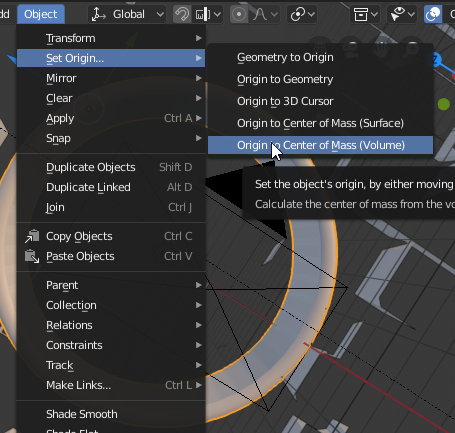 In Blender 2.8 - Object / Set Origin... / Origin to Center of Mass. Not the answer you're looking for? Browse other questions tagged editing 3d-cursor or ask your own question. Is it possible to have Blender orbit with pivot point the mouse cursor?